Tara Lipinski and Johnny Weir have been to the "Happiest Place on Earth," but for one month, every four years, another city can say they too own that title. This year, that city is PyeongChang, South Korea – home of the 2018 Olympic Winter Games and a place where many athletes are hoping to make their dreams come true. The figure skating competition gets underway Thursday, Feb. 8 live in Primetime on NBC and NBCOlympics.com. 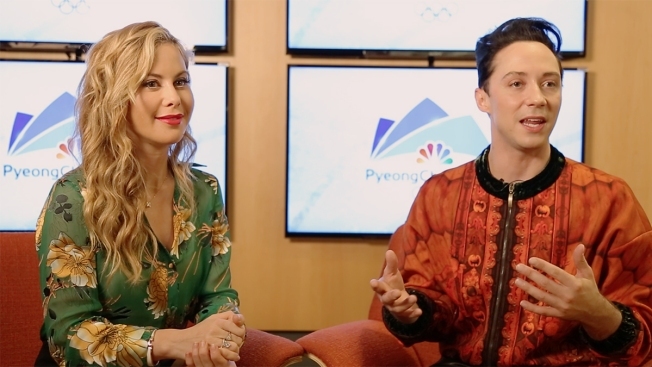 Olympians-turned-analysts Tara Lipinski and Johnny Weir can hardly contain their excitement. Lipinski said in a recent NBC media call that she was as excited about PyeongChang 2018 as when she struck gold at the 1998 Olympics in Nagano, Japan. What Is Tara Lipinski Drawing? Tara Lipinski skated on ice with grace and beauty. Does she draw on a notepad the same way? See if you can guess what Lipinski is drawing. Two-time Olympian Johnny Weir has been a broadcaster at three Games, and said every one of them feels special in their own way. Unlike some other sports in the Olympics where people can watch them pretty frequently, this is figure skating's big stage. All eyes will be on the athletes, this is their time to shine. Tara and Johnny know firsthand how these athletes are feeling. The nerves, the excitement, stepping out onto the ice for the first time. They’ve been there, done that. ​Now instead of nailing that triple Axel, their responsibility turns to telling the viewers at home the stories behind these athletes, teaching them about the sport and why it is so unique. Not only are Tara and Johnny excited for the competition to get underway, but they are excited to be working with one another. "That’s why she’s been so great as a broadcaster and as an athlete. She makes me up my game which really means that Tara’s a great partner,” Weir said of his friend and fellow podcast host.